Grow your business! Advertise with Venue Valet! Venue Valet parks and interacts with thousands of clientele each and every week. 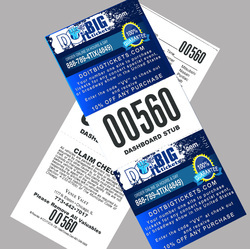 A 4-part ticket stub is used to interact with customers. Their claim tickets are given upon arrival and are required to be kept to pick up their vehicle. Keeping the claim ticket provides great exposure space for business. Full color ad space is available for target audiences. Contact us today! Market and advertise your business with Venue Valet!